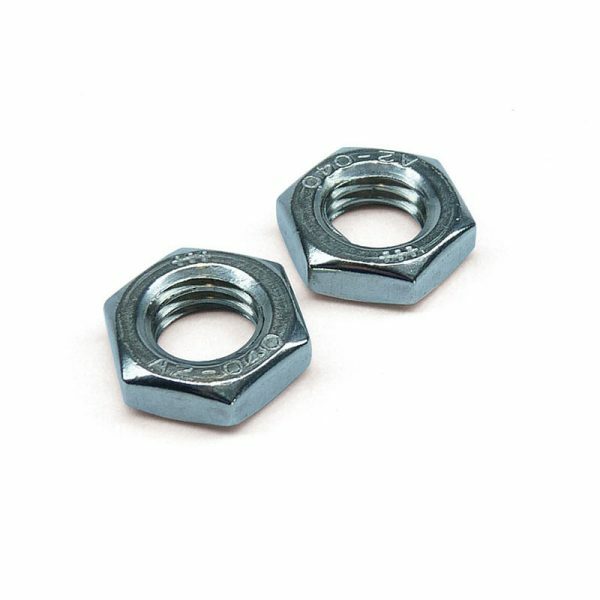 Used in conjunction with a full nut to lock the nut onto the bolt thread. The full nut is tightened first followed by the locknut. Using two spanners the full nut is reversed against the locknut to produce a locking action. Grade A2 stainless steel gives outstanding corrosion resistance under normal atmospheric and wet conditions. 1551060 M 6 2.90mm 10mm Speak to a specialist on 0115 922 1585. 1551080 M 8 3.70mm 13mm Speak to a specialist on 0115 922 1585. 1551100 M 10 4.70mm 17mm Speak to a specialist on 0115 922 1585. 1551120 M 12 5.70mm 19mm Speak to a specialist on 0115 922 1585. 1551160 M 16 7.42mm 24mm Speak to a specialist on 0115 922 1585. 1551200 M 20 9.10mm 30mm Speak to a specialist on 0115 922 1585. 1551240 M 24 10.90mm 36mm Speak to a specialist on 0115 922 1585.